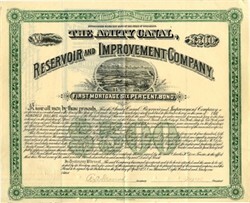 Beautiful certificate from the Amity Canal Reservoir and Improvement Company issued in 1891. This historic document was printed by Denver Litho Company and has an ornate border around it with a vignette of the Amity Canal and Reservoir. This item has been hand signed by the Company's President and Secretary and is over 126 years old. 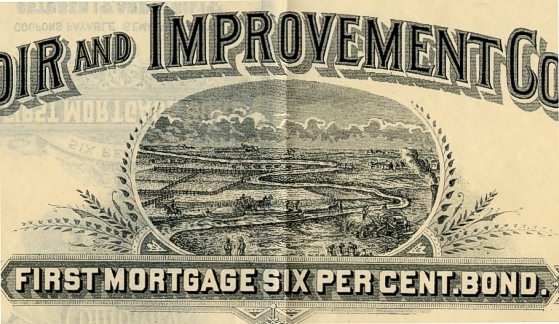 Six percent First Mortgage Bond and the principal paid April 1, 1901 at the Chase National Bank in New York. 15 coupons on bottom. Signed twice boldly by Charles H. Dow as Trustee. Charles Henry Dow (November 6, 1851 � December 4, 1902) was an American journalist who co-founded Dow Jones & Company with Edward Jones and Charles Bergstresser. Dow also founded The Wall Street Journal, which became one of the most respected financial publications in the world. He also invented the famous Dow Jones Industrial Average as part of his research into market movements. On May 26, 1896, the first Dow/Jones Industrial Average was published. He developed a series of principles for understanding and analyzing market behavior which later became known as Dow theory, the groundwork for technical analysis. Born in Sterling, Connecticut, Dow never finished high school. He died in Brooklyn, New York.